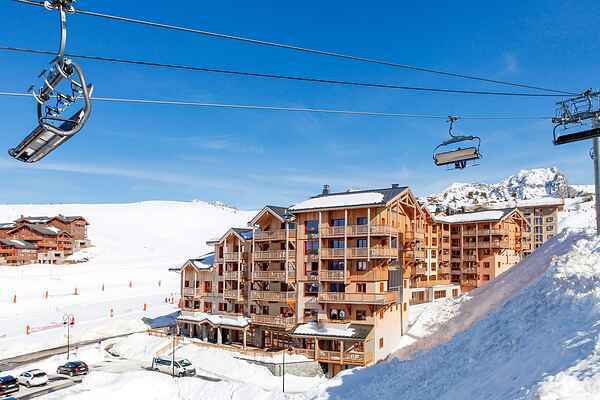 This inviting accommodation is situated in the vast skiing area of Paradiski, which connects the Les Arcs and La Plagne ski resorts. A wonderful skiing area for all levels and ages. Résidence Front de Neige is a brand new accommodation, situated directly on the piste in an area called Plagne Villages. A supermarket, ski school and bus stop for the shuttle bus to Plagne Centre are all within walking distance. The complex consists of a number of terraced chalets, housing around 140 comfortable apartments in total. It also features an attractive, indoor swimming pool with jacuzzi (free) and a spa with a Turkish bath and spa treatments (fees apply). All apartments have a balcony or a terrace and are modernly furnished. A two-person sofa bed is always present in the living room as well as a complete kitchenette. The accommodations range from 2-person to 6-person apartments: FR-73210-166 for 2 guests FR-73210-167 one-bedroom apartment for up to 4 guests FR-73210-168 6-person apartment comprises FR... 1st type and FR 2nd type, fitted with partition doors. FR-73210-169 two-bedroom apartment for up to 6 guests.